The day is coming. That day is almost here. The day in which you have been waiting for all year long. The day where you can cleanse and feel good about doing so. What day are we talking about? Easter? Nope. 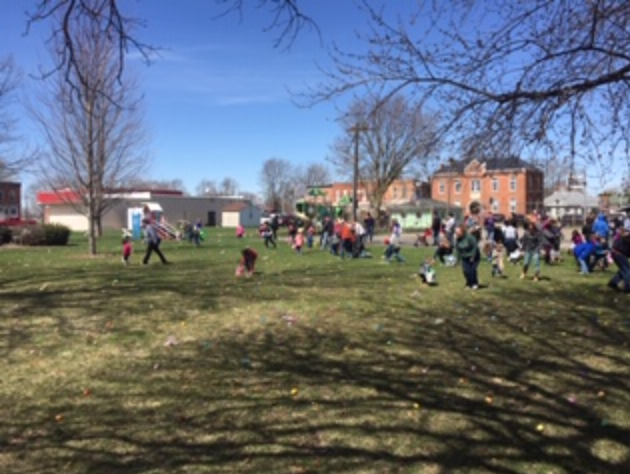 Just as Easter is thought of cleansing your souls from sin, the Annual Village Clean Up Day is the day to clean up and "cleanse" our properties of unwanted junk and clutter and feel good about doing it. This year's Clean Up Day will be Friday, May 3rd from 7:00 A.M. - 10:00 A.M. Please have all of your items set out to the curb the night before so that you don't miss the pick up, as the garbage contractor will NOT be making a second pass through town. There are some changes from past years so be sure to read the flyer carefully. Due to IEPA rules, no electronics will be picked up, but you may take them yourself to Eagle Enterprises in Galva free of charge. This year the garbage contractor will NOT be picking up appliances or other large metal items. You may however between now and Clean Up Day take them to the BACK DOOR of 101 S. Depot St. (former Nestander Antique Store). The new owner of the property will pick them up and dispose of them for you. He will pick up those items weekly. You may also contact anyone else who is willing to take away your metal for you to the salvage yard. Please see the flyer for full details, and let's all work together in cleaning up our properties and make the Village of Altona the BEST looking town in the ROWVA School District. We are nearing the end of the Holy week of Lent - the time that Christian's believe that Jesus Christ Our Lord and Savior died on the Cross and had Risen from the dead for our sins. For those who would like to attend services, please contact your local church of choice for their times. Wednesday Evening Worship - 7 p.m.
April 19th Good Friday Service - 7 p.m.
April 21st Easter Morning Service - 10:45 a.m.
Sunday Worship - 10:15 a.m.
April 19th Good Friday - 12 noon - 3 p.m. & 5 p.m. - 6:30 p.m.
April 21st Easter Morning Son-rise Service - 8 a.m.
April 21st Easter Morning Service - 10:15 a.m.
Joint United Church & Immanuel Lutheran Maunday Thursday service at United Church at 7:00 pm. Sunday School - 8:45 a.m.
Taxes are due tomorrow if you have not completed or mailed them in yet. 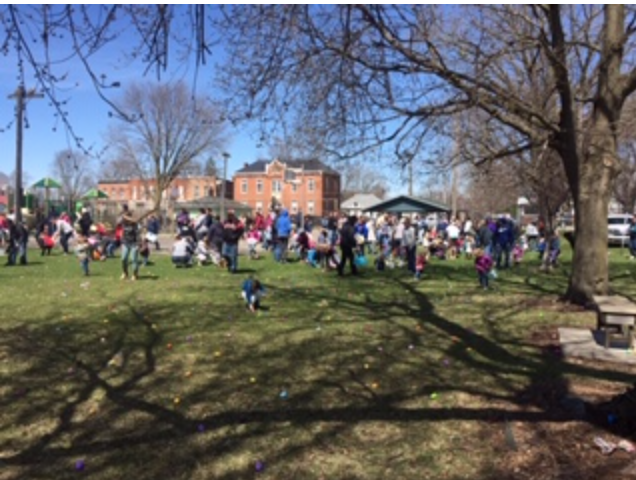 Thank you to everyone who came to the Annual Village of Altona Easter Egg Hunt. 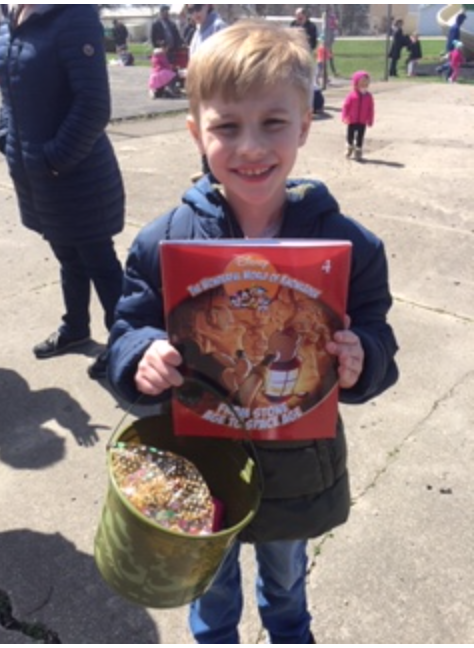 We had 72 children who had picked up the eggs in record time. 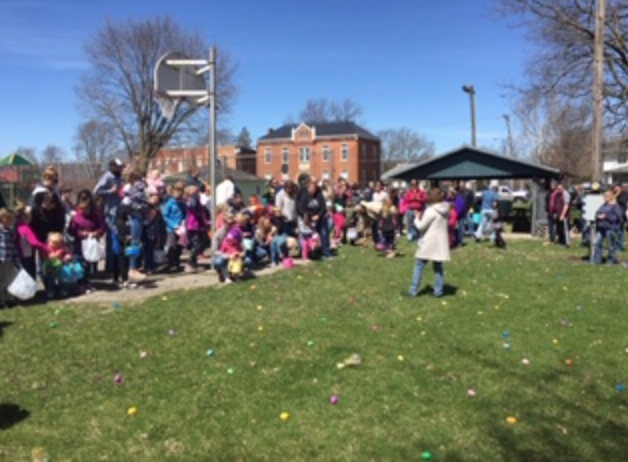 Thank you to both the Altona Lions Club and to the Ransom Memorial Public Library for sponsoring this annual event, as well as to the Walnut Grove Retirees for stuffing all of those eggs. 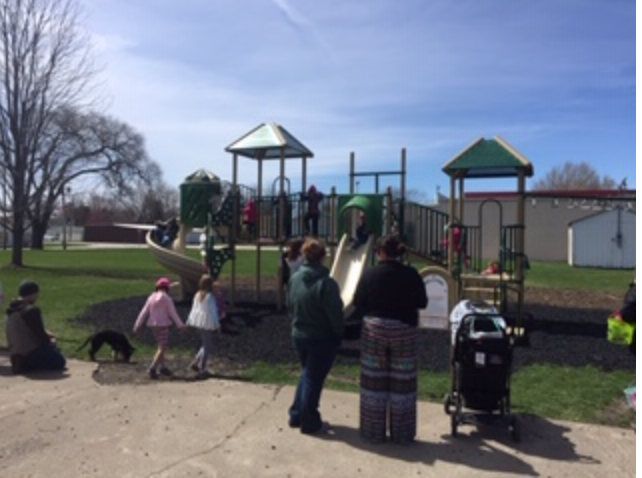 It was a fun time had by all, and all the children and parents seemed to have enjoyed the new playground equipment. Here are some photos of today's event. See you all next year. 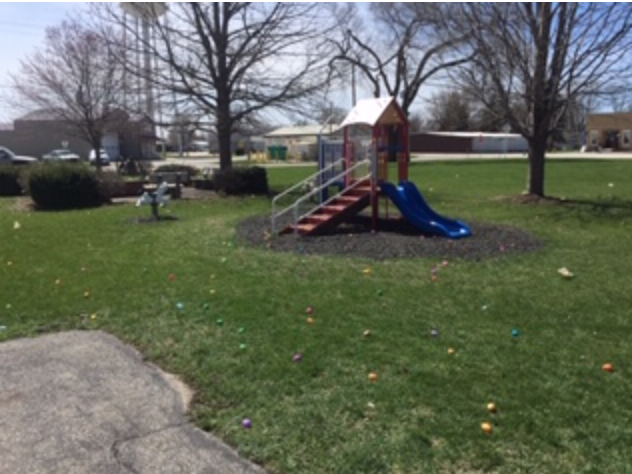 Don't forget that tomorrow is the Annual Easter Egg Hunt in the Village of Altona at Johnson-Pyle park, which is located behind the gas station. The hunt starts promptly at 1 pm SHARP, so make sure that mom & dad don't make you late! This event is open to all children up to the 7th grade. Don't forget to pick out your free book after the event. While you are there, check out the new playground equipment that the Village had installed for you to play on. The rain date for the event will be on Saturday, April 20th should we need it. Lets hope it doesn't rain. 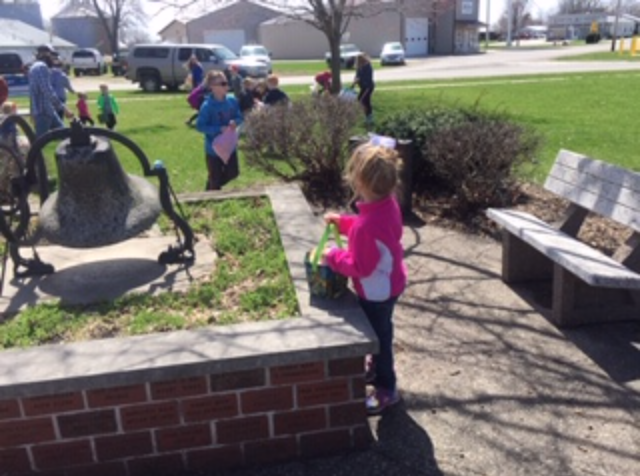 Thank you to the Altona Lions Club and the Ransom Memorial Public Library for sponsoring this yearly event, and also thank you to the Walnut Grove Retirees for filling all of the Easter eggs with candy. Tonight is the last night of the 9th Annual United Church Fish Fry during Lent. Proceeds from the event help fund worthwhile causes. If you haven't had a chance to try it yet, you should. The volunteers make a good meal. Please see the flyer for full details. 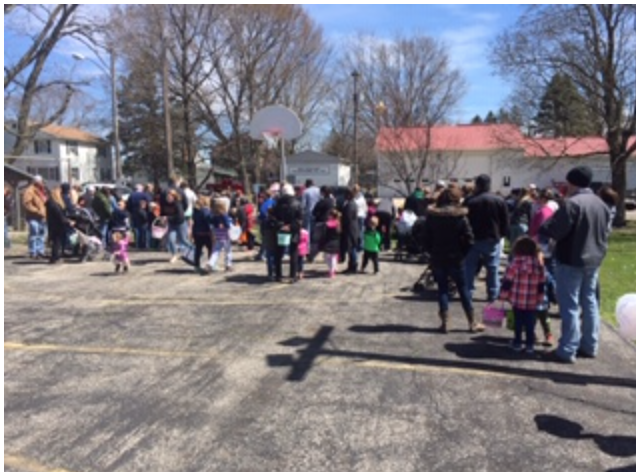 Thank you to all who have volunteered and organized this event, as well as to the entire public for coming out to support our churches and their missions. 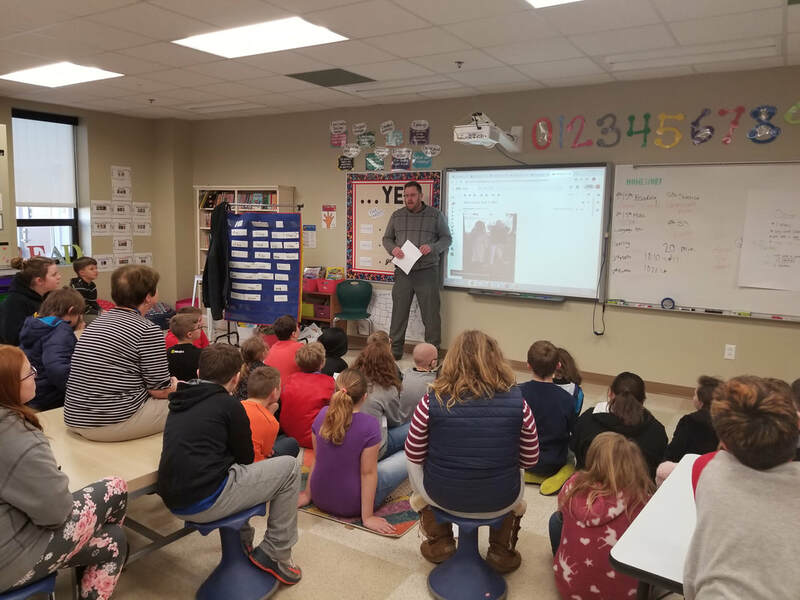 It is the combined effort of volunteers and the support of the public that not only makes small town America the BEST place to live, but to raise and instill family values for our children. Thank you again for supporting the churches and organizations of the Village of Altona. Today April 11, 2019: 12 noon at the United Church, the combined Immanuel Lutheran and United Church Lenten Soup & Devotion. Friday April 12, 2019: 9th Annual Fish Fry Fundraiser for the Mission Team. This is the last fish fry for the Lenten season for the year. Serving times are from 5 p.m. to 7 p.m. You have your choice of either fried or baked fish. Carryouts are available too. It is a good meal if you haven't attended yet. 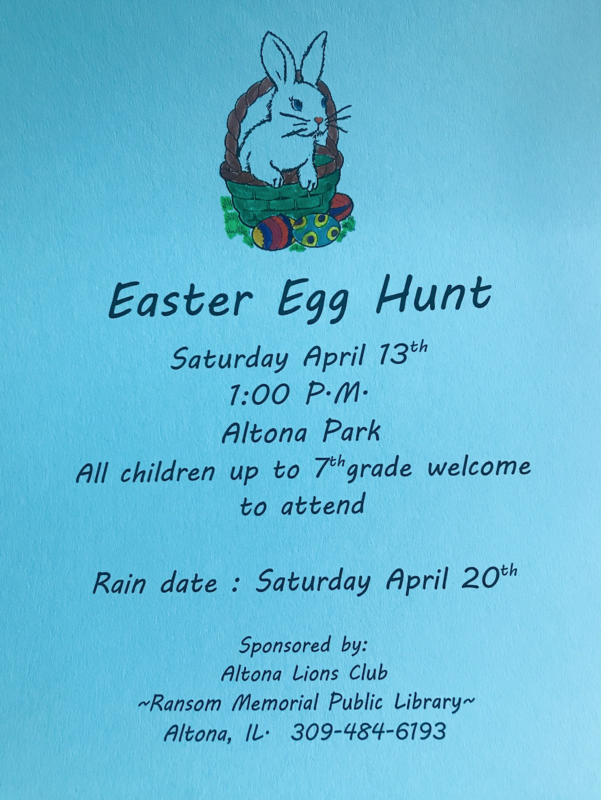 Saturday April 13, 2019: It's once again time for the Annual Egg Hunt sponsored by the Altona Lions Club and the Ransom Memorial Public Library. 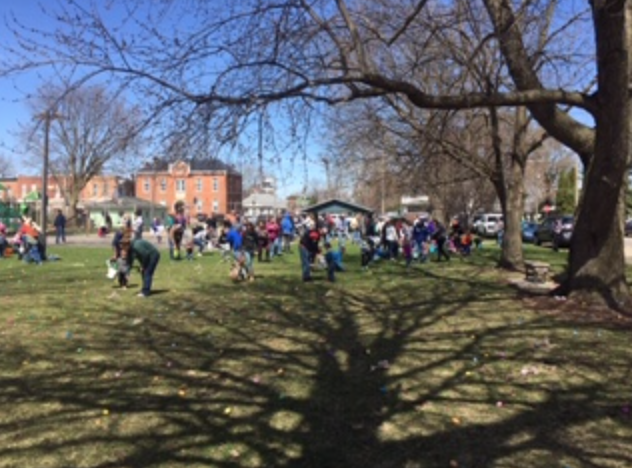 The Easter Egg Hunt kicks off promptly at 1 p.m. DON'T BE LATE! It will be held at Johnson-Pyle park located behind the Hometown Express gas station. All children up to 7th grade are welcome to attend. 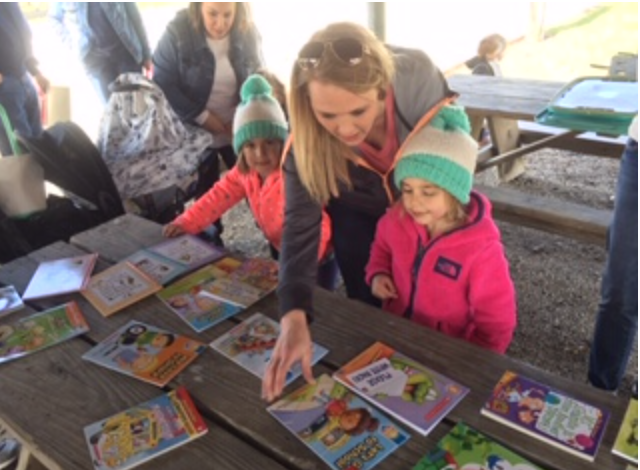 Kids will be able to pick out a free book after the event. Rain date will be Saturday April 20th if needed. 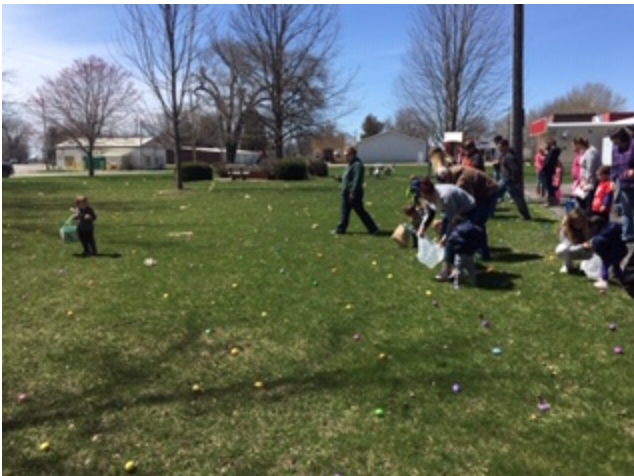 A special thank you to the Walnut Grove Seniors for stuffing all of those eggs, and to both the Altona Lions Club and Ransom Memorial Public Library for sponsoring this annual event. Parents - Please plan on coming to the event early (or staying late afterwards) and have your children check out the new playground equipment. Thank you for supporting the Village of Altona and its organizations! The weather outside is beautiful. 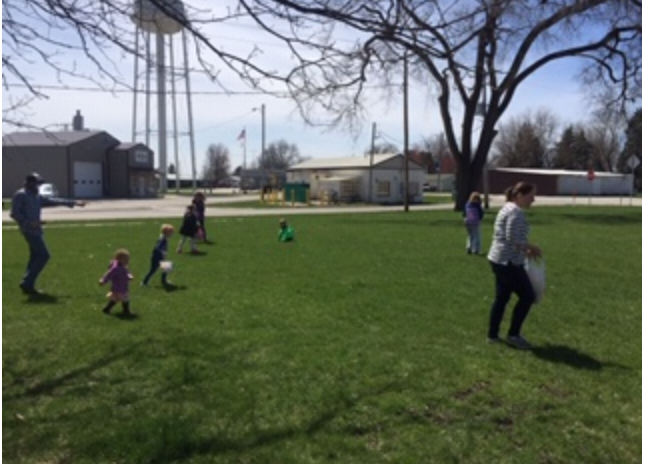 Village residents are starting to take full advantage of the nice weather by cleaning up their properties and to do yard work. The Annual Spring Clean Up Day will be Friday, May 3rd from 7:00 am - 10:00 am. Please have your items set out the night before as the trucks will NOT be making a second pass. Please read the flyer for full details. Have you noticed that you need more storage for your items, but you can't afford to build a new garage or a huge shed to store them in? Did you know that there is another option that will keep you in compliance with the Village's Nuisance ordinance and prevent you from getting a violation letter (which will be sent out after clean up day to those residents who refuse to comply)? That option is a portable garage. 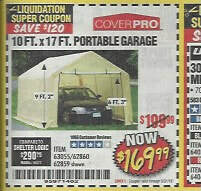 Harbor Freight, Menard's, Lowe's, and Home Depot offer these for sale in a variety of size options. They don't take much to put up, they are affordable, and they can hide a lot of stuff. Most importantly, storing your items in these portable garages will keep your items out of the viewing public and will keep you in compliance under the current nuisance ordinance as well as keep you from getting a ticket. While it is always best practice to just get rid of unwanted and junk items, a portable garage can be the next best thing. Let's all work together and take full advantage of this year's clean up day and make Altona the best looking town in the ROWVA school district. 1) Sell it! The annual community-wide summer yard sale season always kicks off the first weekend in May. Use this time now to start sorting, cleaning, pricing, create signage and getting things all ready for your sale. 2) Throw it away! 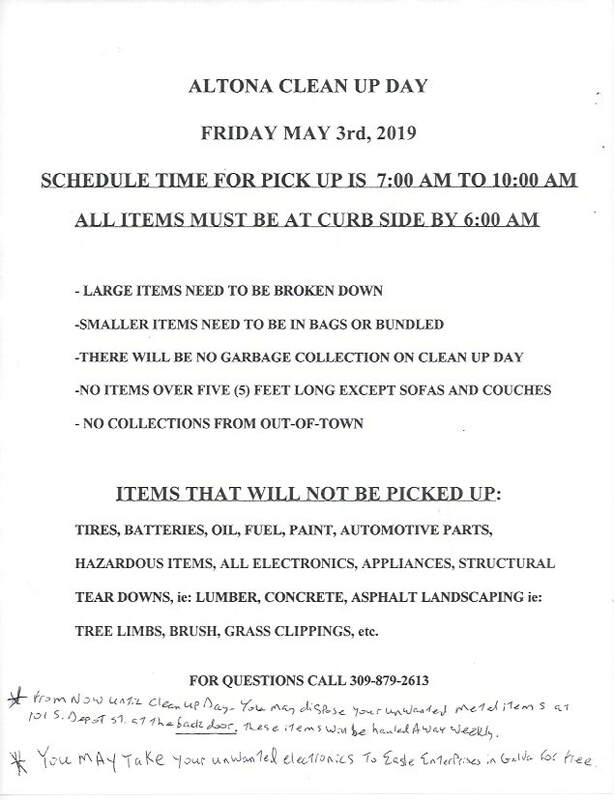 The annual spring Clean Up Day will be Friday May 3rd, 2019 between the hours of 7 - 10 a.m. Please have all of your items to the curb by 6 a.m. that morning. Feel free to set it all out the night before so that you are not late for work the next morning. The drivers will NOT be making a second pass through town. What better time than now to start going through your items and getting them ready to set out to the curb. Please see the flyer for full details, and let's all work towards the same goal of either cleaning up or improving our properties and make Altona the best looking town in the ROWVA school district. Nuisance violation letters will be mailed out to those properties that need it, so please avoid receiving the letter by taking full advantage of the upcoming clean up day. Thank you. I'd like to report on a couple of items to you. First, late this afternoon there was a vehicle stolen in town. I will not disclose the victim nor the incident because the sheriff's department is still investigating the case. I would like to remind everyone that no place is truly safe from crime. It can take place in big cities as well as in small towns such as ours. The first defense against criminals is to LOCK YOUR DOORS! Please be vigilant and make sure that your homes and vehicles are locked. We must make it difficult for a criminal to steal our belongings. Criminals look for "easy targets", whether that may be unlocked doors, keys left in vehicles, windows not locked shut. There are many options in home security. There are video door bells such as the "Ring", there are surveillance cameras or even home monitoring services such as ADT. But everything starts with the simplest home security, and that is to make sure your doors, windows and vehicles are locked. Be safe out there, and as McGruff the Crime Dog says, "Together We Can Take A Bite Out Of Crime!" Second, the vacant lot located at 105/107 S. Depot St. was sold to Cantrell Construction for the highest bid price of $2,000. Other bidders were John Page from Rio for $1,000 and Richard Wegner for $600. Thank you to all bidders for submitting bids. Lastly, spring is finally here. It is time to start going through our unwanted items, throw them away, and clean up our properties from the harsh winter. Violation letters will eventually be sent out, but not unti after the following event takes place. To help aid in this event, the Annual Spring Clean Up Day will be Friday, May 3rd. 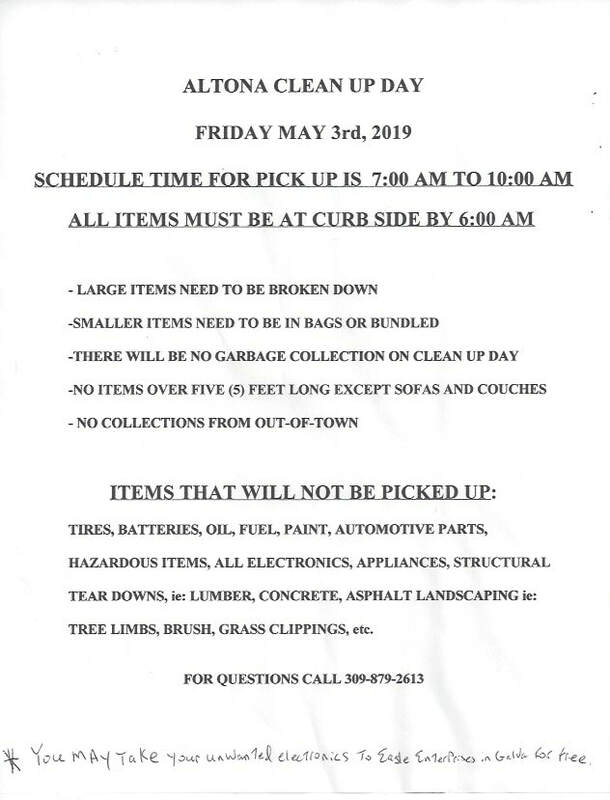 The scheduled time for pick up in town will be from 7:00 A.M. to 10:00 A.M. All items MUST be set out to the curbside by 6:00 A.M as the truck will NOT double back through. It is recommended to just have everything set out the night before. Please be on the look out for the flyers and future postings on the Village website as well as the Facebook page. - Large items need to be broken down. Tires, batteries, oil, fuel, paint, automotive parts, hazardous items, all electronics, appliances, structural tear downs ie: lumber, concrete, asphalt, and landscaping ie: tree limbs, brush, grass clippings, etc. You may take your electronic to Eagle Enterprises in Galva for disposal. Spring has finally come. The robins have returned, temperatures are starting to warm, the grass is trying to green, and the flowers are starting to grow. With all of this, our minds can start to think about other things such as vacations, end of school, or perhaps spending time in the outdoors after being cooped up all the long winter. As we drive let's also remember, that with the change of temperatures there is also a change in what is on our roads. 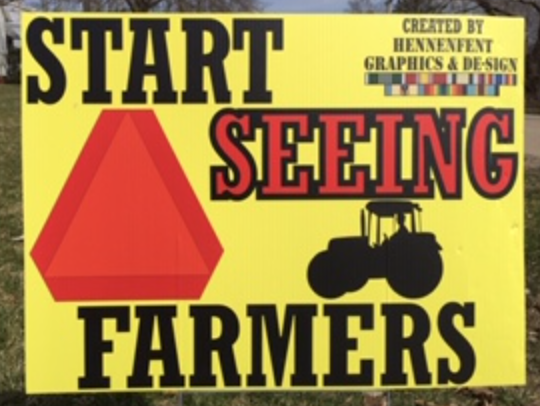 Farmers will be out in the fields with their slow moving equipment and motorcyclists will also be using our roads as well. Let's all pay extra attention when we drive and look out for everyone. Thank you. 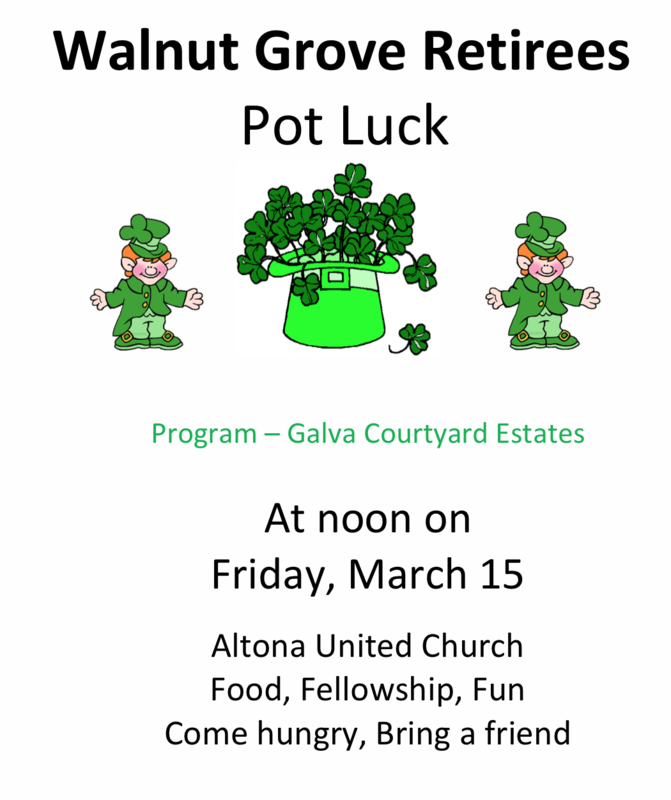 The following is a listing of some upcoming events within the Village of Altona. Please refer to the flyers for those events that pertain to you for full details. Thank you for supporting the churches and organizations of Altona. Sale of 105-107 S. Depot St. 2019-01. Good luck to all bidders. The Village board reserves the right to accept or reject any or all bids. 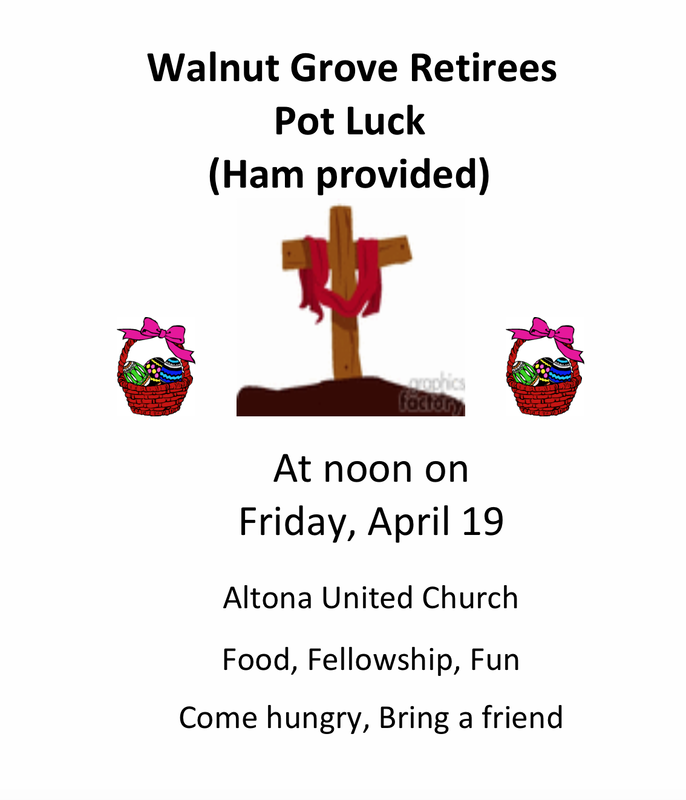 Friday, April 5th: Walnut Grove Retiree's Potluck luncheon. 12 noon at the United Church. 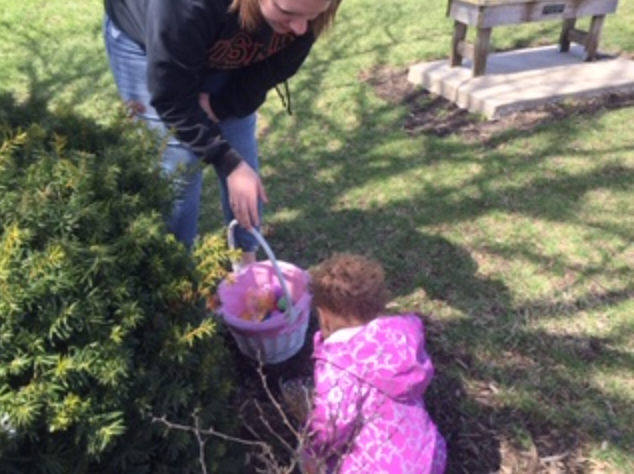 Program - Filling Easter Eggs for the Easter Egg Hunt. Friday's During Lent: Only two Friday Fish Fries left during this Lenten season. April 5th & 12th. They are being held at the United Church in Altona from 5 p.m. - 7 p.m. Baked or Fried fish. Carryout Available. 309-484-5811. 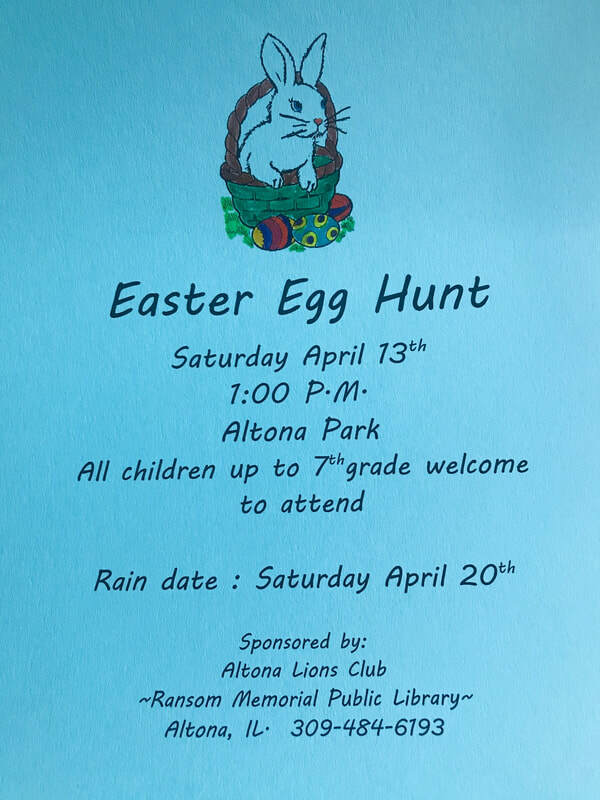 Saturday, April 13th: It's the Annual Easter Egg Hunt sponsored by the Altona Lions Club and the Ransom Memorial Public Library. It will once again be held at Johnson-Pyle Park located behind the Hometown Express gas station. The time is at 1:00 p.m. SHARP!!! DON'T be late or you won't get any candy. All children up to 7th grade are welcome to attend. 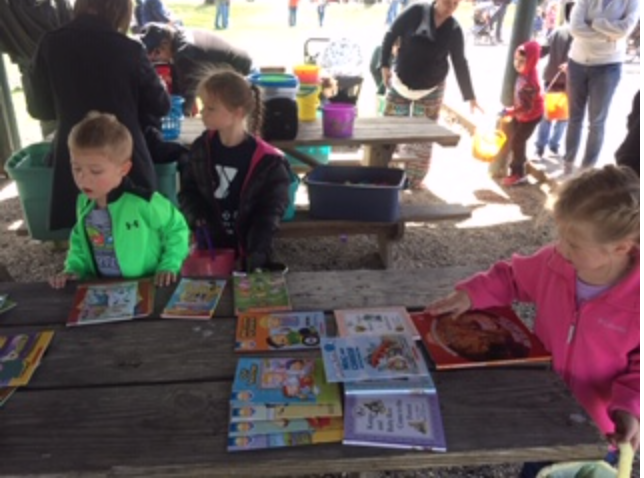 Grab your eggs, get your candy and when you are done, you may pick out a free book to take home as well. Rain date will be Saturday, April 20th if needed. 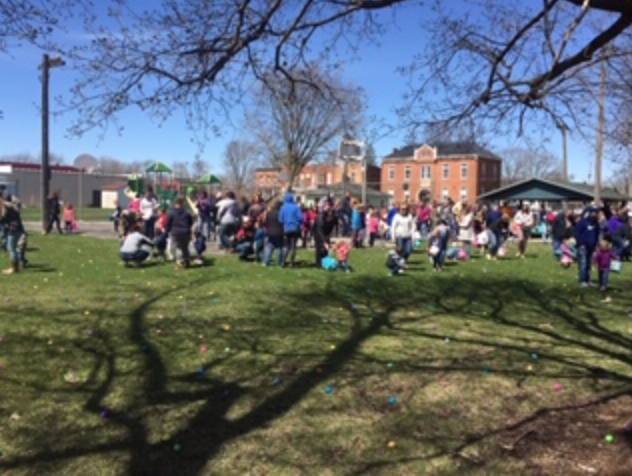 Thank you to the Walnut Grove Retirees for once again helping out with this year's Easter Egg Hunt by stuffing all of those eggs for the children. 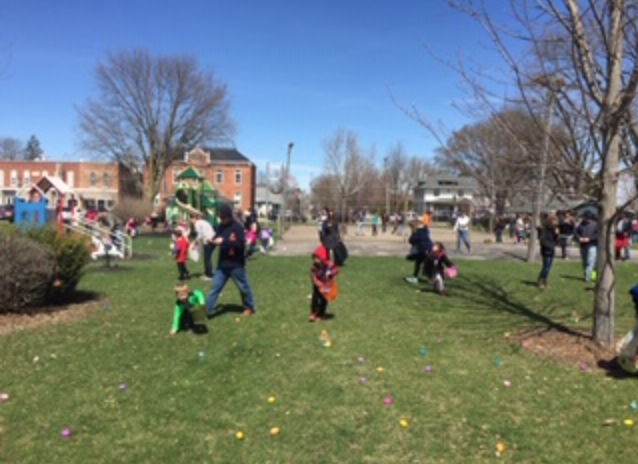 Thank you to both the Altona Lions Club and to the Ransom Memorial Public Library Board for putting on this event for the children. Hey Kids! 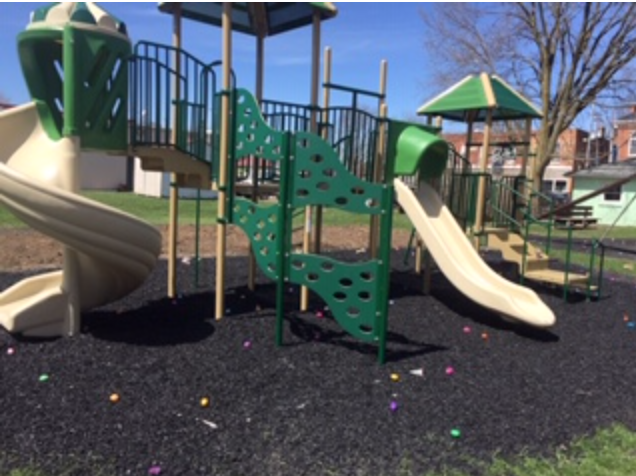 Tell your parents to come early to the Easter Egg Hunt so that you can check out the brand new playground equipment that the Village of Altona had installed for you to play on. Be safe and have some fun! As you know, yesterday was the Consolidated elections in the state of Illinois. The Consolidated elections are typically your municipal and school board elections. Congratulations to all of the candidates who had won their races. For those who are interested, the following link will take you to the Knox County Clerk's website. These results at the time of this posting are unofficial. Thank you for voting. Today may be April Fool's Day, but tomorrow is election day, there isn't no fool'in about that. This year's consolidated elections will consist of school board's and Village Board of Altona elections. For Village Clerk, Kelly Scott will be running unopposed for the remaining two year seat. For Village Trustees, there is a contested race. Four people will be vying for three seats. The top three vote getters will win those seats. Those running for Village Trustee are as follows: Keith Holland, Shirley Kistler, Brian Devito and Richard Wegner. Please do your patriotic duty and vote on Tuesday, April 2nd. The poll for the Village of Altona will be at the municipal building from 6:00 a.m. - 7:00 p.m. It's time for breakfast. Treat yourself to a morning out and take a break from slaving over the stove. Just come to the United Church this morning between the hours of 7 A.M. - 10 A.M. and support the Altona Lions Club during their Pancake Breakfast fundraiser. Menu items include: Pancakes, Sausage, Scrambled Eggs, and Apple Sauce. It's a freewill donation and all proceeds are going towards the Altona baseball diamond. So please come out and support our organizations that support our town. Together we can making a difference. 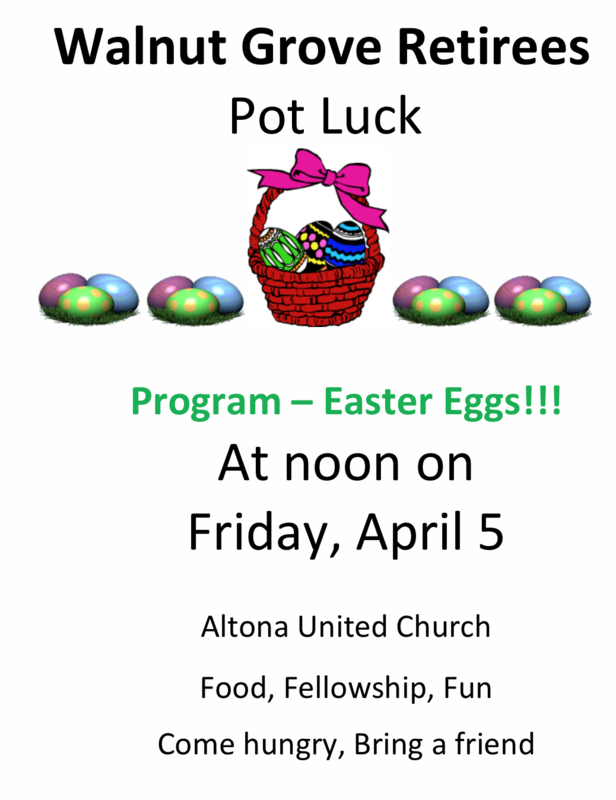 The following is a listing of upcoming events within the Village of Altona. Please read the flyers for full details of those events which pertain to you. Thank you. 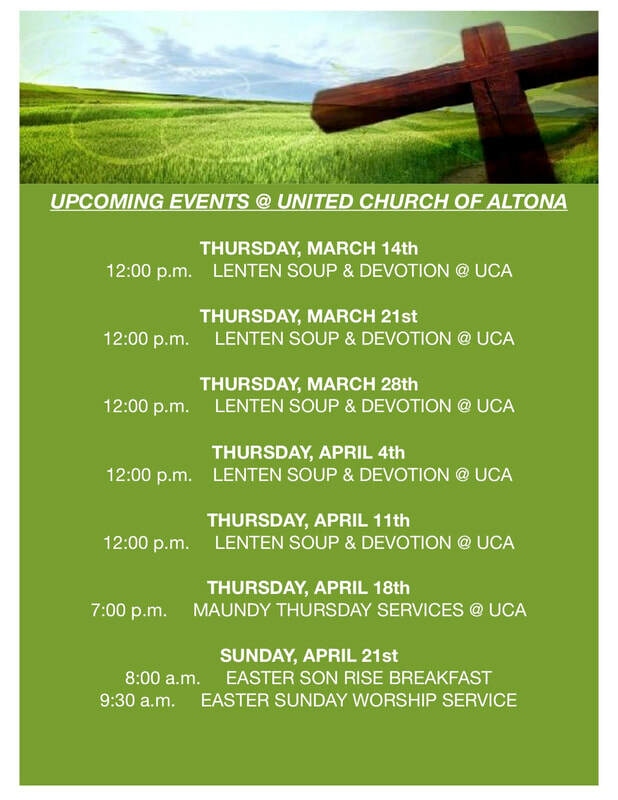 Thursday, March 28 - Lent services at United Church, 12 p.m.
Friday, March 29 - Fish Fry at United Church, 5 p.m. - 7 p.m.
Saturday, March 30 - Altona Lions Club Pancake Breakfast, 7 a.m. - 10 a.m. Village Trustees: Keith Holland, Shirley Kistler, Brian Devito and Rich Wegner. Vote for three. Please view the following flyers for full details of the upcoming events for the week here in the Village of Altona. Thank you for supporting our churches and civic organizations. The following is a list of upcoming events within the Village of Altona. Please see the flyers that pertain to you for complete information. Thank you. 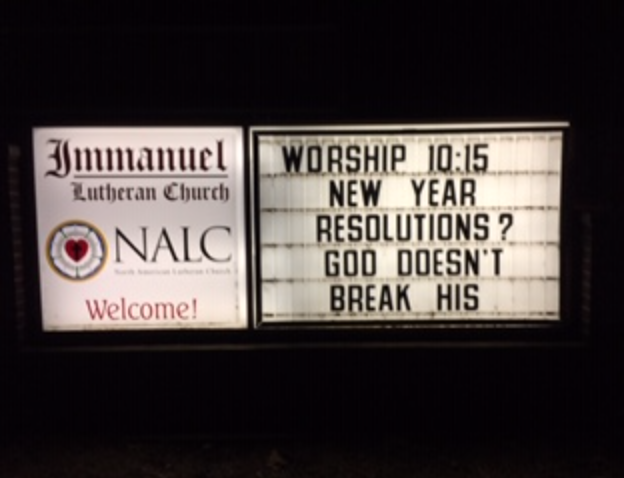 Thursday's: The joined Lenten services between the Immanuel Lutheran Church and the United Church of Altona are being held this year at the United Church. Please see the flyer for the times. Friday's During Lent: The 9th Annual Fish Fry at the United Church from 5 p.m. - 7 p.m. Please see flyer for full details. 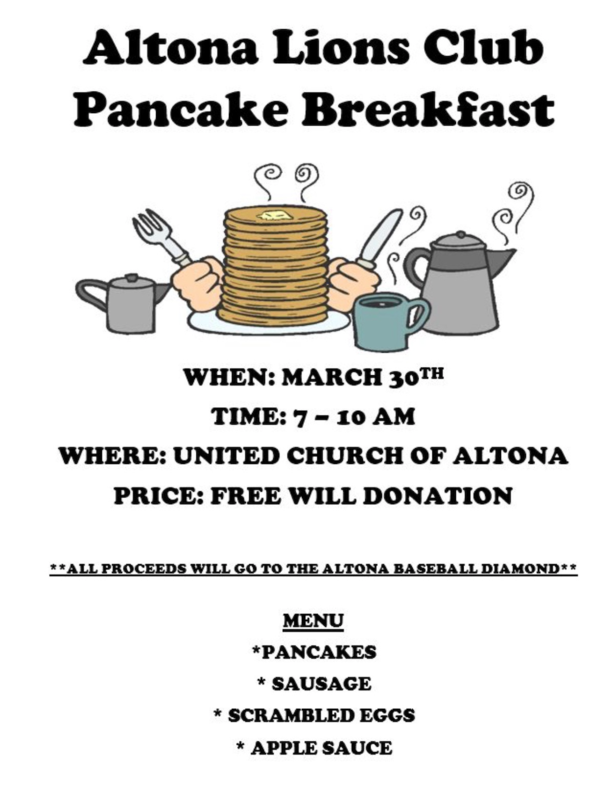 Saturday, March 30th: The Altona Lion's Club Pancake Breakfast. 7 a.m. - 10 a.m. at the United Church. Free will donation. All proceeds to go to the Altona baseball diamond. Trustees - Ryan West, Keith Holland, Brian Devito and Richard Wegner. The three highest votes gets elected. The Poll for the Walnut Grove Township will once again be at the Village Municipal Building in the board room. Water bills were due at the close of business yesterday. If you did not get your bill paid on time, per the ordinance your account is now in delinquent status and your service is subjected to being shut off. Door hangers will soon be delivered to your door informing you of the shut off. Please avoid any inconveniences of having your water service shut off by paying your bill in full. For your convenience, the Village accepts cash, credit cards as well as your good check for payment. Please contact Compton Accounting for all billing questions at 1-844-484-8881. Thank you. Don't forget that tomorrow your water bill is due. For those who have already paid, thank you. If you have any questions about your bill, please direct those to Compton Accounting. They can be reached at 1-844-484-8881. For your convenience, the Village accepts cash, credit cards and your good check for payment. There is a $50 reconnect charge that is added to any account which is shut off for lack of payment. Any account not paid by the close of business at 4 p.m. on the 20th of each month becomes delinquent and is subjected to having services shut off. Please pay your bill on time to avoid any inconveniences. Thank you. Spring is upon us despite the weather's temperature tug of war between Mother Nature's spring, and Old Man Winter. It is enough to make a certain groundhog conflicted. It has been a hard winter for not only us, but on our properties as well. Trees have not only shed sticks in our yards, but in some cases have broken limbs which needs attended to. With spring comes our Annual Clean Up Day which is usually held on the second Friday in May. While this year's date has not been set yet, there is no better time than now to start going through your items and decipher what you want to keep and what you wish to throw away. Full details will be announced on this year's Clean Up Day once the garbage committee gets everything worked out with our garbage contractor. Stay tuned. 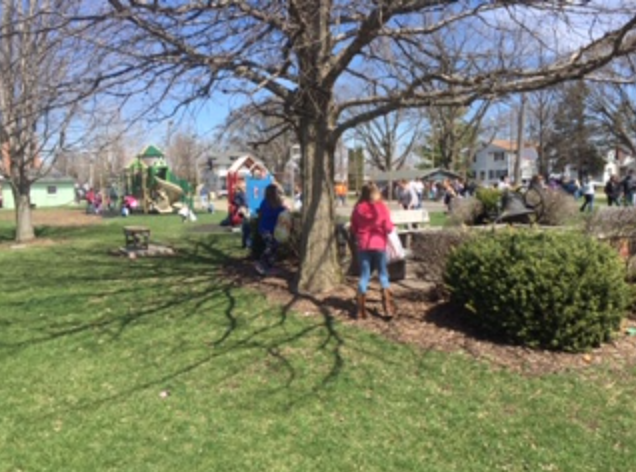 With spring also comes the Village's annual kickoff to the summer yard sale season. The kickoff has always been the first weekend in May to allow you a chance to sell your unwanted items before throwing them away on Clean Up Day, which historically falls on the second friday in May. Please start going through your items, cleaning them, pricing them and making your yard sale signs. Both the kickoff yard sale weekend as well as the Clean Up Day will be here before you know it. If everyone does their part and commits to making their properties look the best that they can, then we can make Altona the best looking community in the R.O.W.V.A. school district. Starting to clean up our properties now, will also prevent a nuisance ordinance violation letter later as well. Let's all do our part, and clean up our properties. Thank you. This is just a friendly reminder that water bills are due by the close of business day on Wednesday, March 20th, at 4 P.M. Any payment that is not received by then is considered delinquent, and that account is subject to penalty charges and being turned off per the ordinance. Please do NOT take the chance of having your water turned off at a bad moment (such as in the middle of your shower when you are all lathered up). There is a $50 reconnect fee charged to any account which is turned off due to lack of payment. Please get your water bill paid on time to avoid these issues. For your convenience, the Village accepts cash, credit cards and your good check for payment. Thank you. Today is St. Patrick's Day, so may the luck of the O' Irish be with you. Regardless if you are Irish or not, will you be celebrating? If so, how? Are you having a party? Will you be serving beer? Do you know how to make green beer? Answer: Put a drop of green food coloring in your beer and stir it up. Will you be having a trivia game? If so, click on the following link to learn about the history of St. Patrick's Day. Regardless how you celebrate, please choose a designated driver. Please don't drink and drive. The 9th Annual Fish Fry at the United Church in Altona starts today. $10 for the Fish Meal and $5 for the Childrens Chicken Strip Meal. See the flyer for full details. It is that time of year again - Lent. 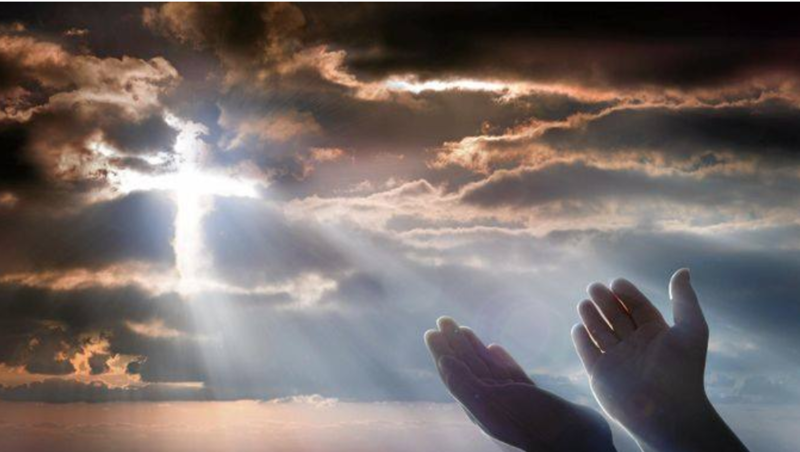 The time that Christians start to prepare themselves for the Crucifixion and Raising of Jesus Christ Our Lord and Savior. For those who would like to attend services, please contact your local church of choice for their times. Ash Wednesday Service - 7 p.m.
Ash Wednesday Ashes & Communion - 12 noon - 1:30 p.m. & 4 p.m. - 5 p.m.
Ash Wednesday Lenten Service - 7 p.m.
April 21st Easter Morning Sonrise Service - 8 a.m.
Ash Wednesday Services - 7 p.m.
Thursday Soup Lunches for Lenten Soup and Devotions. 12 noon - 1 p.m. on March 14, March 21, March 28, April 4, April 11, April 18. The cost of the United Church Fish Fry is $10 for the fish meal and $5 for the Children's Chicken Strips meal. Here is a list of upcoming events within the Village of Altona. Please be sure to mark your calendar's and read the flyers for those which apply to you. 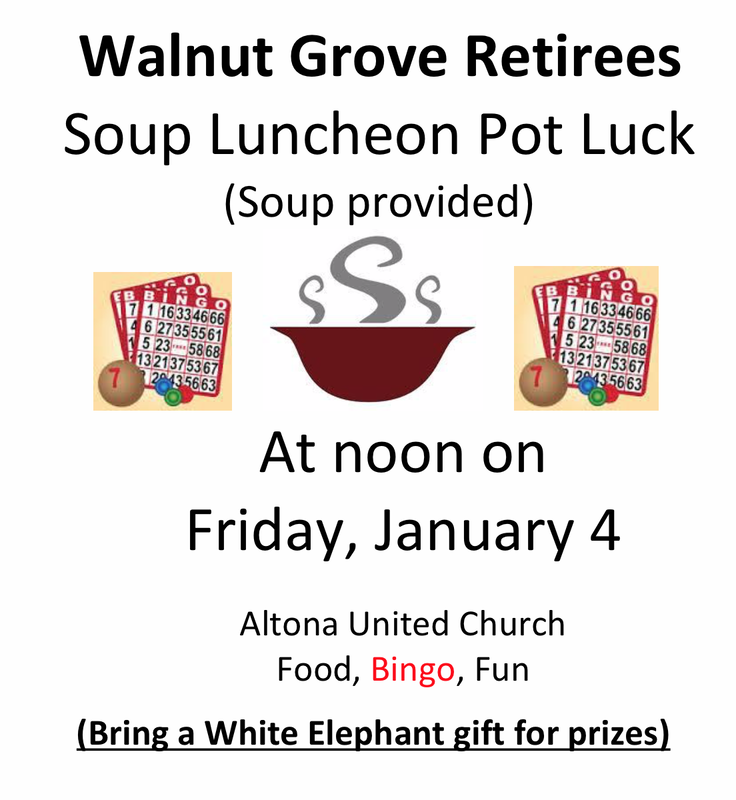 Friday, March 1st: Attention Walnut Grove Retirees. After the February break, the bi-weekly potluck lunches are back. The potluck will be held at the United Church at 12 noon. 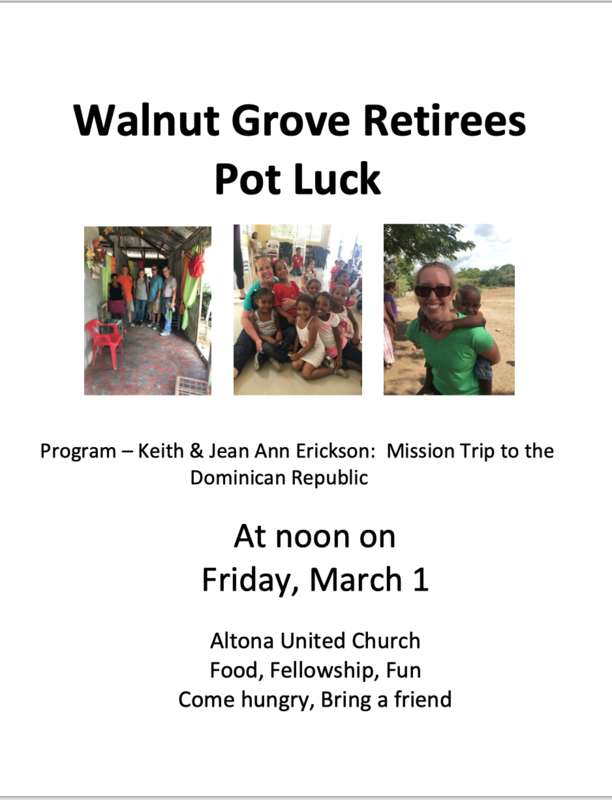 This week's program will be a report on the mission trip to the Dominican Republic by Keith and Jean Ann Erickson. 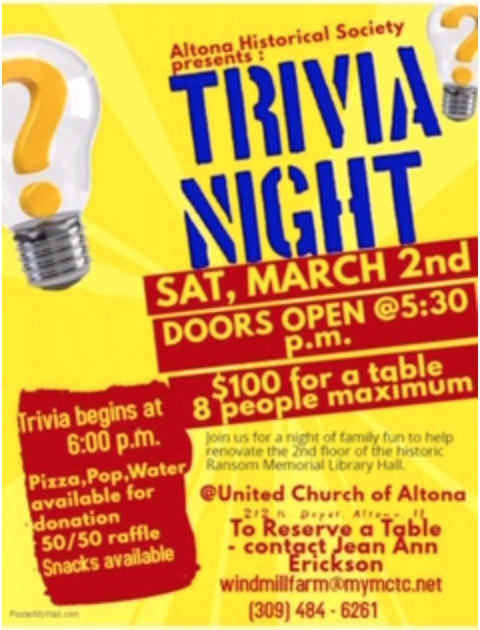 Saturday, March 2nd: The 2nd Annual Altona Historical Society Trivia Night! This year it will be held at the United Church. Doors open at 5:30 p.m. and Trivia starts at 6 p.m. $100 for a table of 8 people max. Food for sale as well. See flyer for full details. Friday, March 8, 15, 22,29, April 5, 12: 9th Annual United Church Fish Fry. Serving from 5 pm - 7 pm. Today, Sunday February 24: It's the 18th Annual Altona Fire Department Chili & Soup Lunch, which will be held at the fire station. Lunch will be served from 11 am - 2 pm. Take out and delivery are available. Phone 484-2112. While you are there, don't forget to purchase your gun raffle tickets. Tickets are $20 and only 200 tickets will be sold. The winner will get their choice of an AR15, Springfield Pistol, Henry Rifle or $500 cash. You need not be present to win, however you must possess a valid VOID card should you choose to accept the firearm. While you are at the fire station, please consider joining the fire department. They are in need of volunteers. These are our local heros. Please support those who support us in our time of need. 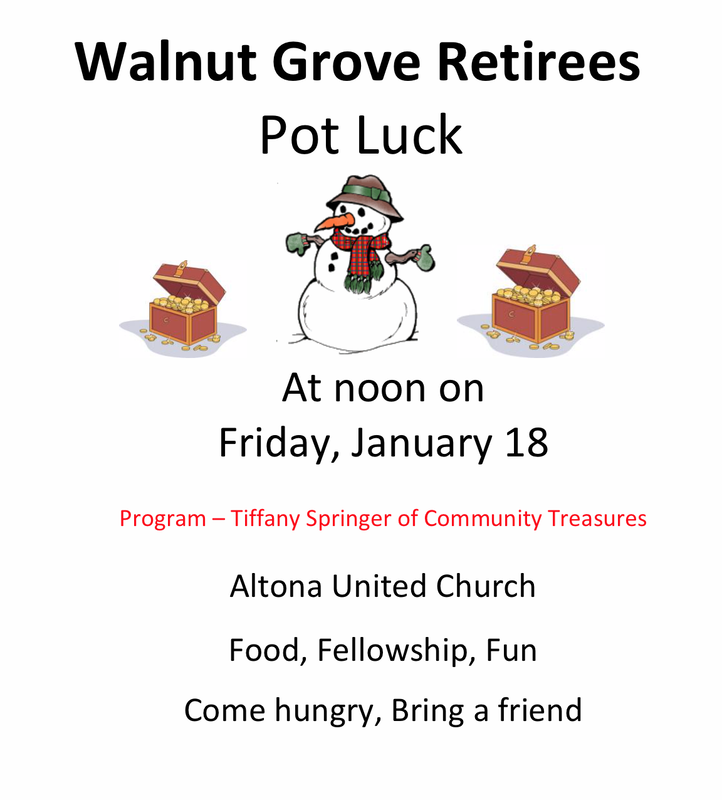 Friday, March 1st: Walnut Grove Retirees Potluck. 12 noon at the United Church. Program: Mission to the Dominican Republic by Keith & Jean Ann Erickson. Saturday, March 2nd: The 2nd Annual Altona Historical Society Trivia Night. This year's event will be held at the United Church. Doors open at 5:30 pm with food available for purchase. Trivia Nights begins at 6 pm. A $100 donation will get you a table for 8 people maximum. Please make note of the following upcoming dates of happenings and events within the Village of Altona. Please read the flyers below for full details. Wednesday, February 20th: Water Bills were due by the close of business at 4:00 p.m. If you did not get your water bill paid on time, your account is now in delinquent status and penalty charges have been applied. Shut off notices are going out to you. Please pay your bill in full prior to having your water shut off during an inconvenient moment (for example: taking a shower). As a reminder, there is a $50 reconnect fee that is applied to any account which has its water shut off due to lack of payment. For your convenience, the Village does accept cash, credit cards and your good check for payment. The phone number for Compton Accounting is 1-844-484-8881. Thank you to all who have paid their bill on time. Sunday, February 24th: The 18th Annual Altona Fire Department Chili & Soup Lunch will be held at the fire department. Lunch is from 11 a.m. - 2 p.m. Take out & delivery are available. Phone 484-2112. Don't forget that the drawing for the Firemen Firearm Raffle will also be at 1 p.m. Need not need to be present to win. Only 200 tickets will be sold, so get yours before they are gone. See any fireman or Keith Holland at the TBA. A $20 ticket will get your chance to win your choice of: AR-15, Springfield Pistol, Henry Rifle or $500 cash. Firearm value not to exceed $600. Must possess a valid FOID card to receive firearm. The Altona Fire Department is also in need of volunteers. Please inquire about how to volunteer while attending the Chili & Soup Lunch. The following is a listing of some upcoming dates for you to mark on your calendars. Please read the flyers for full information. Wednesday, February 20th: Water Bills are due by the close of business at 4:00 p.m. Please Contact Compton Accounting with any questions regarding your bill or to make a credit card payment. 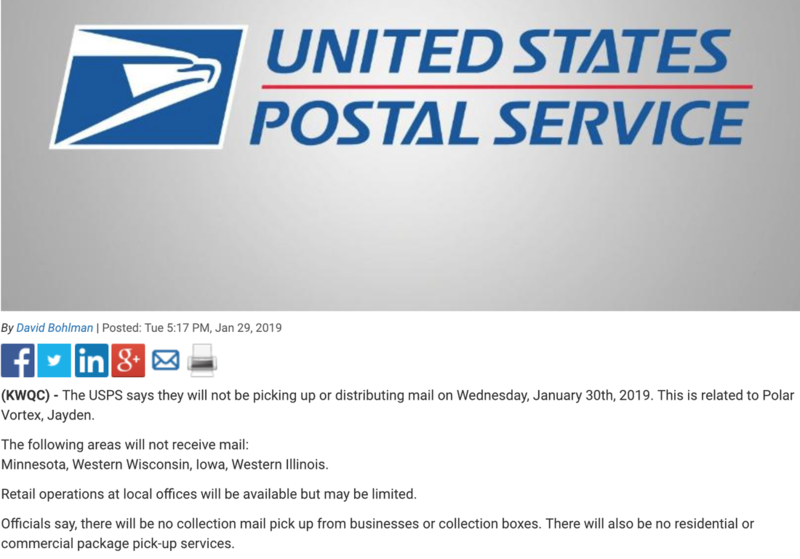 Otherwise, just mail it or drop off your payment at their office. Thank you to all who have paid their bill on time. Sunday, February 24th: The 18th Annual Altona Fire Department Chili & Soup Lunch at the fire department. Lunch is from 11 a.m. - 2 p.m. Take out & delivery available. Phone 484-2112. Don't forget that the drawing for the Firemen Firearm Raffle will also be at 1 p.m. Need not need to be present. Only 200 tickets will be sold, so get yours before they are gone. See any fireman or Keith Holland at the TBA. A $20 ticket will get your chance to win your choice of: AR-15, Springfield Pistol, Henry Rifle or $500 cash. Firearm value not to exceed $600. Must pocess a valid FOID card to receive firearm. Saturday, March 2nd: The Second Annual Altona Historical Society Trivia Night! This year it will be held at the United Church. Doors open at 5:30 p.m. and Trivia starts at 6 p.m. $100 for a table for 8 people max. Food for sale as well. See flyer for full details. Our garbage contractor T. R. Rubbish wanted to inform everyone that garbage pickup will be today instead of yesturday due to the icy road conditions. Thank you. Old Man Winter sure has been keeping the National Weather Service busy this winter. They have updated and issued yet another Winter Weather Advisory as well as having issued a Wind Advisory. Winter Weather Advisory: The Winter Weather Advisory is in effect from now until 12 noon today. Last night at the Village of Altona Board of Trustees meeting, the Village board had voted to accept sealed bids for vacant lot known as 105-107 S. Depot Street. Bid opening will be at the April 4, 2019 board meeting at 7:00 P.M. Please read the entire ordinance for full details, and good luck to those who wish to offer a bid. A Wind Advisory is in effect until 3 AM on Friday. Northwest winds from 30 -40 mph, with gusts up to 50 mph. A Wind Chill Advisory is in effect until 10 AM Friday. Very cold wind chills dropping to 15 - 20 degrees below zero. Due to the icy road conditions on the back country roads, R.O.W.V.A. School District will NOT be in session today. The National Weather Service has issued a Special Weather Statement: Freezing rain likely Tuesday night. The icy roads are likely to impact your Wednesday morning commute to work and school. For full details and amounts of projected ice from this statement, please click on the following link. Thank you and drive safely. 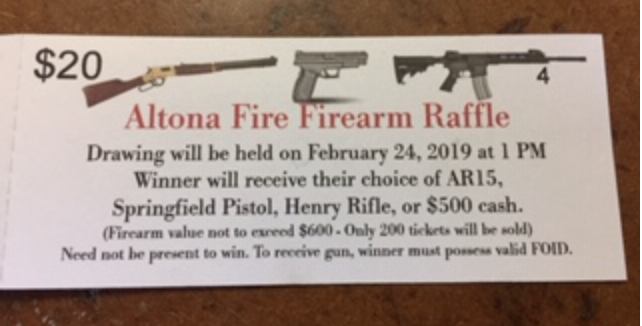 The Altona Firemen still have raffle tickets available for purchase for their annual gun raffle. Please see a fireman or stop by the Altona TBA for details. Also the Altona Volunteer Fire Protection District is in need of volunteers. Please consider giving back to your community by volunteering. The Wind Chill Warning still remains in effect until Noon today. Expect wind chills as low as -40 below zero. It is extremely important that you cover all exposed skin if you have to go outside as frostbite or hyperthermia can occur in as little as 10 minutes. Please continue to check up on your neighbors and friends, especially the elderly to see if they are ok. Be sure to bring in your pets immediately after letting them outside to do their business. On a warmer note, the weather is expected to be in the 40's this weekend. Snow accumulations are expected to be from 1" - 3" inches. Please be sure to have your vehicles off of the streets in order for the Village to better plow the white stuff off of the roads. The Weather Advisory will be from 2 PM this afternoon to 3 AM on Friday. Did you know that you can access the current temperature and weather forecast by simply visiting the Village of Altona website? Just go to our homepage at altonaillinois.weebly.com and click on the weather banner. Start getting your teams ready now before the tables sell out. It goes unsaid that it is cold outside. 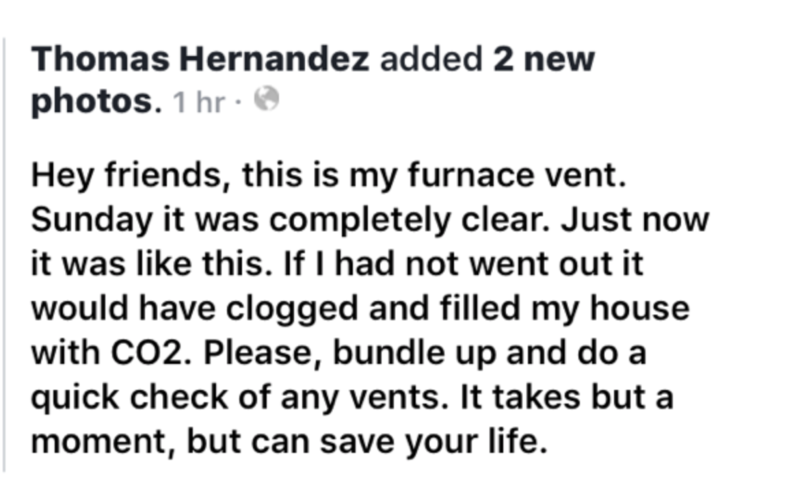 While staying home and indoors is the safe thing to do in order to stay out of the elements, there is something else that would be a good idea to check on.... that would be your high efficiency furnace outlet. Don't let ice build up on it. 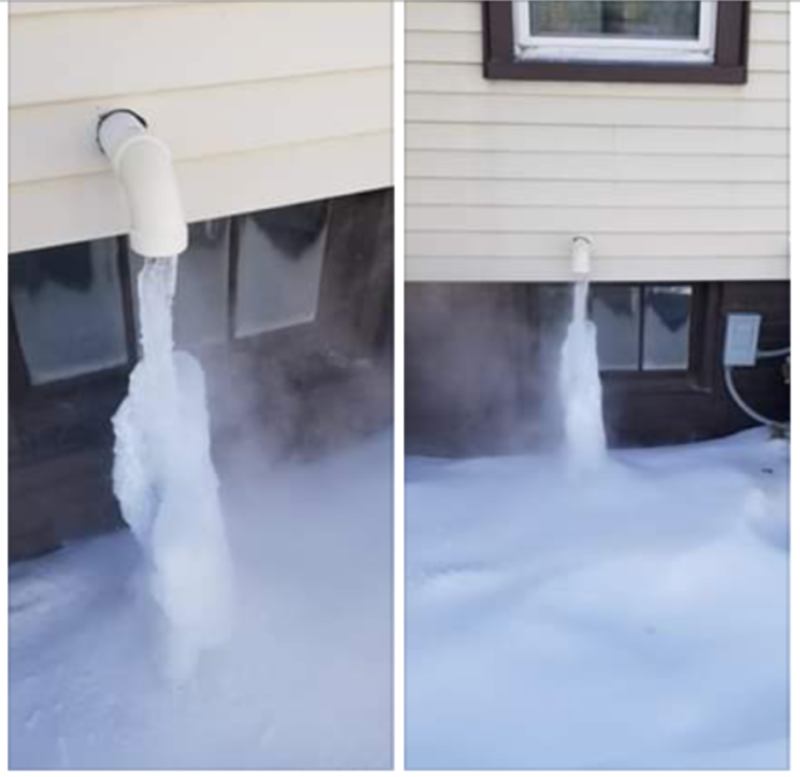 If you notice ice, break it off so that it does not clog up and create carbon monoxide in your house. Carbon monoxide has no odor. 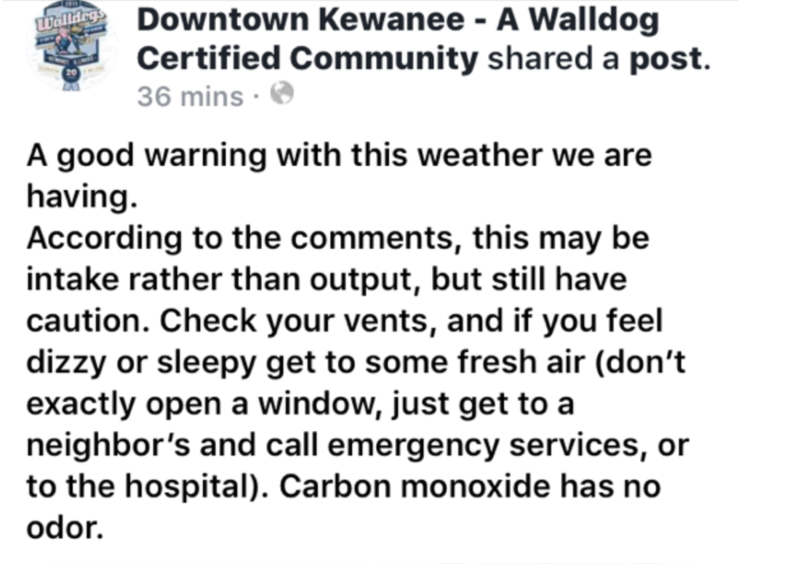 Please view the facebook pages from Kewanee that were sent to the Village for posting. Be safe. 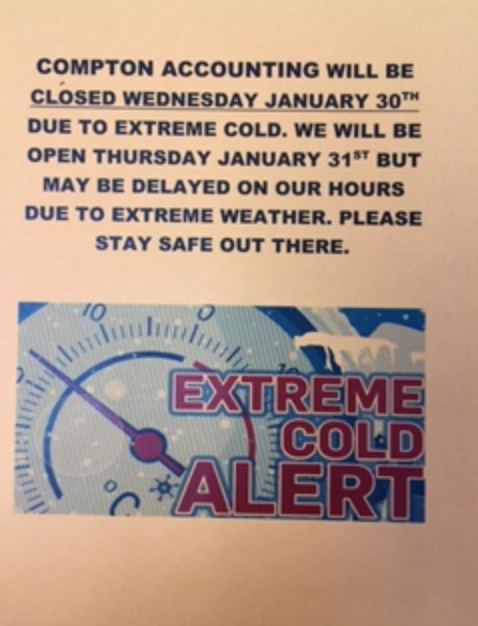 Here is an updated list of local closings due to tomorrow's extreme cold weather. Please do not venture out if you do not have to. -50 degree wind chills are nothing to play around with. If you must venture out, be sure to cover all exposed skin to prevent frostbite as skin exposed to these extreme temperatures can result in frostbite within 5 - 10 minutes. Tomorrow would be a good day to take a vacation or sick day from work. Be sure to bring your pets inside. Be safe. Garbage service for Altona and Victoria on Wednesday will be DELAYED until Thursday. Garbage service for Oneida on Thursday will be DELAYED until Friday. The National Weather Service has issued a Wind Chill Advisory & Warning! Wind Chill Advisory is in effect from now unti 6 PM on Tuesday. Wind Chill Warning is in effect from 6 PM Tuesday until Noon on Thursday. DANGEROUSLY low wind chills as low as -50 degrees below zero is expected. Frostbite could occur in as little as 5 - 10 minutes to any unexposed skin. Please stay indoors if at all possible. If your employer will let you work from home, please do so. Please bring all pets indoors. If you must travel, be sure that you take blankets, food, water, and a charged cell phone with you should you get stranded. The National Weather Service has issued a Wind Chill Advisory beginning at 6 PM tomorrow night and lasting until 12 Noon on Friday. Very cold wind chills are expected to range from -15 to -25 degrees below zero. Please bundle up and make sure that you have no exposed skin as frostbite could occur in as little as 30 minutes of exposure. Please make sure that your pets are inside as well and that you check up on your neighbors, especially the elderly. If you are traveling, be sure to have blankets and other provisions with you should you get stranded. Cold weather can be rough on pets. Please bring them inside and out of this weather if at all possible. If not, be sure that they have appropriate shelter from the elements and plenty of food and water to drink. Also please check up on your neighbors, especially the elderly. The frigid weather will soon pass. 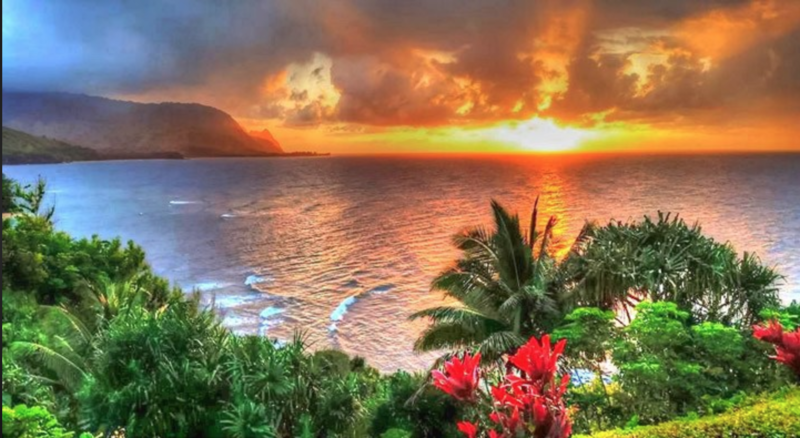 Thinking warm thoughts such as Hawaii may help you. Perhaps this photo will help. Thank you to all who had helped remove snow from last nights storm. Whether you helped clean the sidewalks downtown, or at one of the churches, or just helped shovel snow for one of your neighbors; you played a vital part in getting things back to normal. 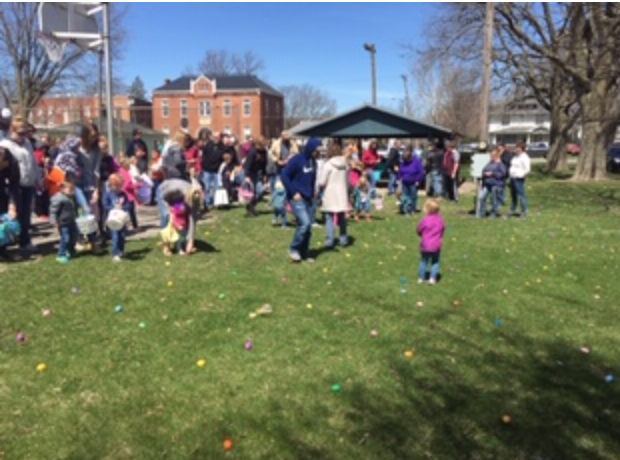 It is volunteerism and coming together like this that makes living in a small town a great place to be. I doubt that you'll find this friendliness in places like New York or Chicago. Speaking of volunteering; the Altona Fire Department is still in need of volunteers. 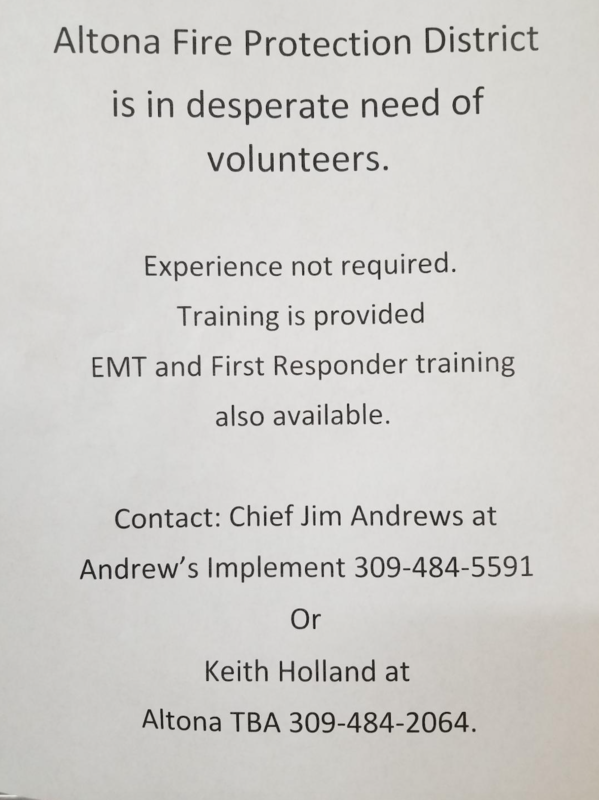 Please contact Fire Chief Jim Andrews at Andrews Implement or Keith Holland at the Altona TBA. Please consider volunteering and giving back to your community. It is also time for the Altona Fireman Annual Gun Raffle. Tickets can be purchased at the Altona TBA or from a fireman. The drawing will be held on February 24th at 1 PM. The winner will get their choice of either an AR15, Springfield Pistol, Henry Rifle, or $500. If you are interested you better hurry, because only 200 tickets will be sold. The Winter Storm Warning issued by the National Weather Service is still in effect until 6 PM this evening. Please stay home and do not venture out on the roads if at all possible. 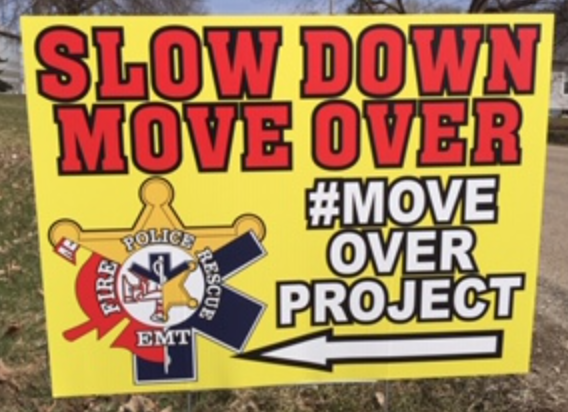 This will not only be the safer alternative for you, but it will allow all road crews to remove snow in a more timely matter. The Village of Altona will remain under a snow emergency until our employee has been able to remove the snow from our streets to make them passable. A snow emergency is issued when the snow accumulation reaches 3 inches. All vehicles must be removed from the streets in order to allow our plow to remove the snow in a more timely matter as well as to provide a lesser chance of damage to your vehicle. The National Weather Service's Winter Storm Warning for tonight is still in effect from 6 PM this evening until 6 PM on Saturday. Heavy snowfall is expected with accumulation amounts from 4"-6" inches with wind gusting as high as 40 mph. Please be advised that a snow emergency will be in effect for the entire Village once snowfall reaches 3 inches. Please make plans now to have all vehicles removed from the sides of the streets in order for our snowplow to remove the snow in a more productive manner. The Village does not wish to damage anyone's vehicles. Having your car along the side of the road increases the risk of an accident due to poor visibility. Please stay at home if possible. If you MUST get out, please drive carefully and have the proper winter survival items in your car should you get stranded. Make sure that your cell phone battery is fully charged. Please click on the following link to read the entire National Weather Service Winter Storm Warning. Thank you and be safe. Just a friendly reminder that water bills are due on the 20th. The 20th falls on a Sunday this month and Compton Accounting is not open on the weekends. If you are paying by electronic mean such as with a credit card, please see them before the close of business on Friday the 18th for that assistance. Compton Accounting closes at 4 PM. Otherwise you may either mail in your good check or drop it off in the door mail slot if you need to anytime over the weekend to comply with paying your bill on time. Remember there is a $50 reconnect fee which is applied to any account which has its service shut off due to lack of payment. For your convenience, the Village accepts cash, credit cards, and your good check for payment. Thank you. I would like to publicly thank the R.O.W.V.A. 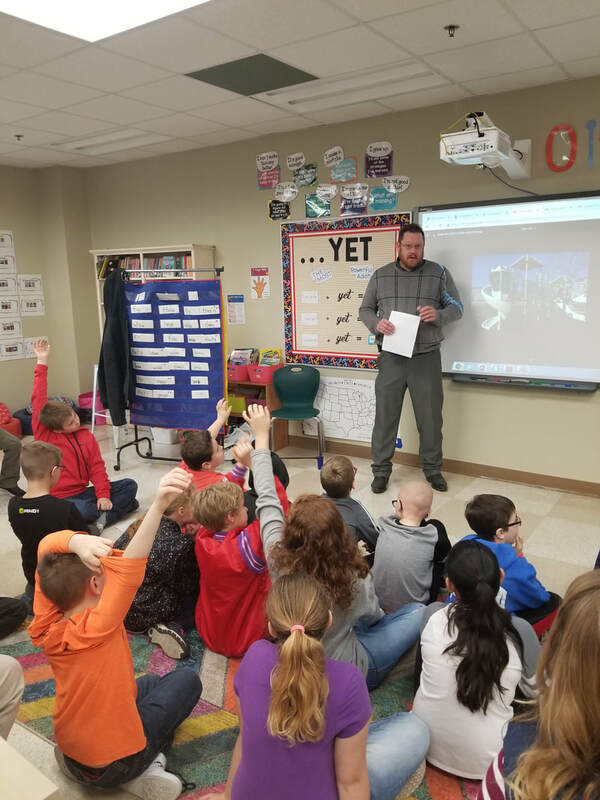 Elementary School for inviting me to talk about local government to the entire fourth grade class today. The children were very well behaved and had many many questions. Apparently after the my talk they had some pretty good discussions that had followed. So thank you to Ms. Litchfield and the rest of the teachers for inviting me. I had thoroughly enjoyed it. Here are are couple of photos from today's event. There were approximately 40 people present. 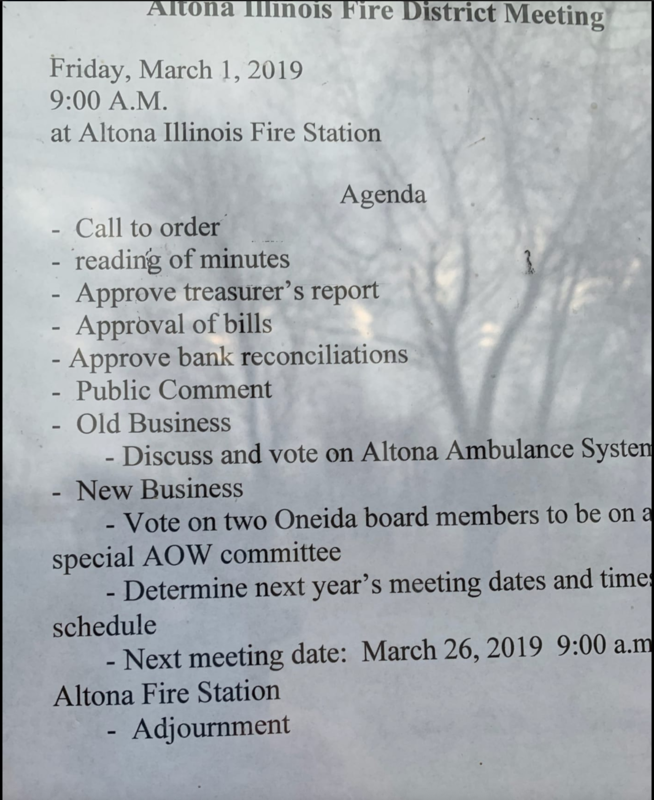 For those who may be interested, there is an Altona-Oneida-Wataga Ambulance Service meeting toight at the Altona Fire Department at 7 p.m.
Today is National Law Enforcement Appreciation Day. The men and women who work the streets fighting crime, catching drug dealers, and helping stranded motorists have very dangerous job. While many of us may have jobs that can be dangerous, law enforcement have jobs that involve criminals shooting at them with the intent of killing them. Because of this, we should all be very grateful to those willing to step up and be our heros for trying to keep us all safe. So to everyone working in law enforcement, whether at the Federal, State or Local level....... THANK YOU for all that you do! If you would like to show your appreciation to law enforcement today, offer to pay for their meal, buy a cup of coffee or just say THANK YOU. They would appreciate it no doubt. The National Weather Service has issued a Wind Advisory which is in effect until 9 pm tonight. Please click on the following link for further details. Happy New Year! The year is only three days young and many of you may have made new year resolutions. Have you broken yours yet? Don't get discouraged and stay positive. If you have found (or are starting to find) yourself slipping off of your resolution, just start all over and try again. Instead of thinking it as the dreaded "New Year Resolution," think of it as a goal. Write it down and get someone to help support you in keeping you on track. If your resolution is to lose say 25 -50 pounds this year, don't think of it as a long drawn out marathon but as many short little races. Try making a goal of losing one pound this week. Then when you make your goal, try it again, etc. Give yourself an incentive to stay on track. If your goal is to lose a lot of weight, then you'll want your end goal to buy a new wardrobe when your done. This ultimately will be exciting, but treat yourself along the way to help you maintain focus and on track. Make these little "awards" fun and something that you would look forward to do to stay focused. Whatever your resolution - or goal is, just break it down into short manageable little pieces instead of one long drawn out boring process. You may find that it will be easier to concur, and more fun as well. After all, if we can't have some fun in doing things in life, is it really worth doing at all? May you all have a safe, prosperous and happy new year!